Witness Ishaan and Ritika’s extravagant celebration of love shot beautifully in Hua Hin, Thailand. 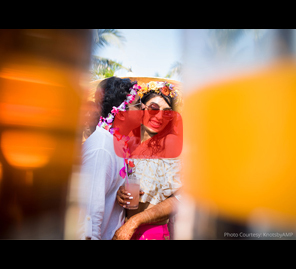 Ishaan and Ritika's wedding video shot by WeddingSutra Favorite 35mmCandids is a beautiful montage of memories that evoke warmth and joy - from the opening drone shots of blue waves surging to the beach flanking the resort in Hua Hin to the many intimate - and funny moments - moments captured with fly-on-the-wall subtlety. The story opens with a sweeping panorama of the beautiful venue by the ocean in the jewel that is Thailand. It’s a breathtaking teaser of the theatrical extravaganza to follow. High on emotion and heavy with sensitivity, the wedding video then captures the father of the groom sharing a few words. This is followed by both sides of the family telling us what the couple means to them. As they talk about each other, The bride is gentle and thoughtful and the groom has a wonderful aura – intangible attributes that are skillfully captured by the intuitive camera. Each wedding is unique and like all others and we see that Ritika and Ishaan too, celebrate their union with the familiar rituals- getting ready, dancing, religion – all put together in seamless storytelling. The somber traditional moments give way to dancing and heady times at the party by the beach and that changes the tempo of the early part of the video. 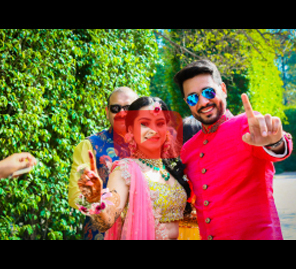 The wedding video does not follow a strictly linear approach, preferring to create a montage of events that feature different emotions and tempos. 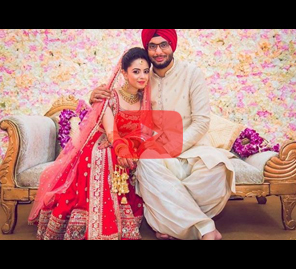 A large-scale location and many small, precious moments come together to give this wedding video a sense of scale as well as intimacy, and you feel you know the family intimately after it ends. Thailand, beauty, bonhomie are all hallmarks of this wedding captured for posterity - and repeated viewings - by the talented team at 35mmCandids.